Scotland head coach Grant Bradburn wants his side to hit the ground running today in the first of two One Day Internationals against Afghanistan at The Grange (10.45am). The Scots have not played a full international fixture since they defeated Hong Kong in the World T20 event in Nagpur, India back on March 10. As a result the squad, led by Mazars Grange batsman Preston Mommsen and featuring Carlton seamer Ali Evans and Heriot’s spinner Mark Watt, are eager to get out there and play. “The guys learnt a lot from the World T20 event and they have trained well over recent months, but nothing beats actually playing competitive fixtures to gauge where you are as a group,” Kiwi Bradburn said. The second match in Stockbridge is due to take place on Wednesday. 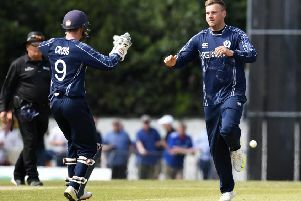 Scotland squad: Preston Mommsen, Kyle Coetzer, Ali Evans, Brad Wheal, Calum MacLeod, Con de Lange, Craig Wallace, Mark Watt, Matthew Cross, Michael Leask, Richie Berrington, Safyaan Sharif, Ruaidhri Smith.